We’d love your help. Let us know what’s wrong with this preview of The Encyclopedia of Trouble and Spaciousness by Rebecca Solnit. The incomparable Rebecca Solnit, author of more than a dozen acclaimed, prizewinning books of nonfiction, brings the same dazzling writing to the essays in Encyclopedia of Trouble and Spaciousness. 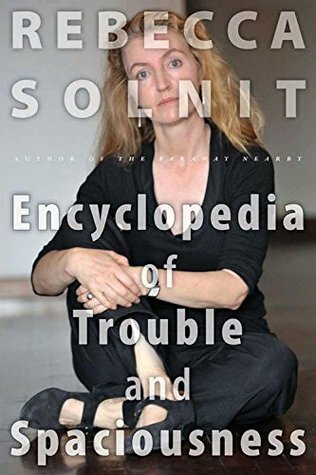 As the title suggests, the territory of Solnit’s concerns is vast, and in her signature alchemical style she combines commentary on history, justice, war and peace, and explorations of place, art, and community, all while writing with the lyricism of a poet to achieve incandescence and wisdom. Gathered here are celebrated iconic essays along with little-known pieces that create a powerful survey of the world we live in, from the jungles of the Zapatistas in Mexico to the splendors of the Arctic. This rich collection tours places as diverse as Haiti and Iceland; movements like Occupy Wall Street and the Arab Spring; an original take on the question of who did Henry David Thoreau’s laundry; and a searching look at what the hatred of country music really means. Solnit moves nimbly from Orwell to Elvis, to contemporary urban gardening to 1970s California macramé and punk rock, and on to searing questions about the environment, freedom, family, class, work, and friendship. It’s no wonder she’s been compared in Bookforum to Susan Sontag and Annie Dillard and in the San Francisco Chronicle to Joan Didion. The Encyclopedia of Trouble and Spaciousness proves Rebecca Solnit worthy of the accolades and honors she’s received. Rarely can a reader find such penetrating critiques of our time and its failures leavened with such generous heapings of hope. Solnit looks back to history and the progress of political movements to find an antidote to despair in what many feel as lost causes. In its encyclopedic reach and its generous compassion, Solnit’s collection charts a way through the thickets of our complex social and political worlds. Her essays are a beacon for readers looking for alternative ideas in these imperiled times. To ask other readers questions about The Encyclopedia of Trouble and Spaciousness, please sign up. Radicals often speak as though we live in a bleak landscape in which the good has yet to be born. Not only is there an alternative, but it’s here and always has been. This collection of 29 essays, previously published in a variety of literary venues, demonstrates Rebecca Solnit's virtuosity as an compassionate intellectual, a keen and critical observer of the human condition, and a preeminent force in American letters. Solnit is neither a politician nor an academic. She is not a researcher nor an Radicals often speak as though we live in a bleak landscape in which the good has yet to be born. Not only is there an alternative, but it’s here and always has been. Solnit is neither a politician nor an academic. She is not a researcher nor an environmentalist by training. She is a public citizen with a heightened sense of justice, an activist who advocates for the most vulnerable through her stunning ability to see patterns, to make shape from chaos, to order the world so that the rest of us can understand and find hope in the midst of utmost despair. Through her sharp and tender dialogue, Rebecca Solnit brings us to see what we have turned away from because it's just too much to take on. And through her words, we can see our way past the turmoil into possible answers. Into hope. The essays in The Encyclopedia of Trouble and Spaciousness range from the Arab Spring to climate change, from the crumbling of Detroit to the devastation in Haiti after the 2010 earthquake and in Japan after the trio of disasters in March 2011. Solnit takes these faraway or far-removed disasters and brings their relevance home to the reader. The geography she covers is so wide-ranging that the book comes with a map to aid in tracking Solnit's travels, yet it is the map of heart and intellect that leaves the most searing impression. How many times did I grab my partner's arm while we sat side-by-side, to read him an excerpt, to insist that he read this essay or that, until I finally pushed the book at him, declaring it a must-read, a life-altering exploration into 21st century social justice? Because a few years have passed since the original publication of many of these essays, Solnit's wondering about the power of the Occupy Movement, the lasting effects of the Arab Spring, the masses rising up against the power of Google in a public transportation protest, take on an almost-poignant aspect. From the perspective of hindsight, we can see how Solnit's predictions play out and how her most fervent optimism fizzles in the face of American ambivalence, greed, and short attention spans. Climate change is global-scale violence against places and species, as well as human beings. Once we call it by name, we can start having a real conversation about our priorities and values. Because the revolt against brutality begins with a revolt against the language that hides that brutality. Maybe it’s important to make a distinction between what gets called material and what real materialism might be. By materialistic we usually mean one who engages in craving, hoarding, collecting, accumulating with an eye on stockpiling wealth or status. There might be another kind of materialism that is simply a deep pleasure in materials, in the gleam of water as well as silver, the sparkle of dew as well as diamonds, an enthusiasm for the peonies that will crumple in a week as well as the painting of peonies that will last. This passion for the tangible might not be so possessive, since the pleasure is so widely available; much of it is ephemeral, and some of it is cheap or free as clouds. Then too, the hoarding removes the objects — the Degas drawing, the diamond necklace — to the vault where they are suppressed from feeding anyone’s senses. The Butterfly and the Boiling Point, a reflection on the Arab Spring and the cause of revolutions in general. Rebecca Solnit's writing is lucid and luminous, her opinions informed and passionate, her optimism cautious and grounded, her inspiration undeniable. She holds our faces to the fire, forces us to recognize the danger and the beauty, and helps us see ways to help ourselves and yet be citizens of the world. Truly one of our greatest contemporary thinkers, activists, writers and revolutionaries. Highly recommended. This was the first book written by Rebecca Solnit that I read and I must say I loved her writing. Although the essays were on topics such as drugs, real estate, Mexico, etc. the language was so poetic that I actually kept a marker to highlight paragraphs that I could quote and revisit. Also, the depth of the writing was quite impressive. From now on she is definitely one of my favourites. I wanted to adore this collection of Solnit's essays, as I have so much of her writing in the past, but I...didn't. There is much here to admire, and certainly enough to love to make it worthwhile, but there's also a pervasive didacticism I didn't find in her other writings. The essays vary from long-form internet polemics to absolute magical gems, and overall I'm certainly not sorry I took the time -- but I'll admit that I wanted more from the collection (what a name! what a delicious name!) th I wanted to adore this collection of Solnit's essays, as I have so much of her writing in the past, but I...didn't. There is much here to admire, and certainly enough to love to make it worthwhile, but there's also a pervasive didacticism I didn't find in her other writings. The essays vary from long-form internet polemics to absolute magical gems, and overall I'm certainly not sorry I took the time -- but I'll admit that I wanted more from the collection (what a name! what a delicious name!) than I ultimately got. This book is all over the place. And by this I mean physically all over the place. From Iceland, to Japan, to San Francisco, to Detroit, to New Orleans, to México, she has opinions on many themes, and while I found some of them inspiring, others were a little pretentious. I really enjoyed the good parts, her thoughts on Thoureau being one of my favorites, but those essays on Iceland I just could not get myself interested in, and the one apologizing to Mexico (me being a Mexican) I found very gra This book is all over the place. And by this I mean physically all over the place. From Iceland, to Japan, to San Francisco, to Detroit, to New Orleans, to México, she has opinions on many themes, and while I found some of them inspiring, others were a little pretentious. I really enjoyed the good parts, her thoughts on Thoureau being one of my favorites, but those essays on Iceland I just could not get myself interested in, and the one apologizing to Mexico (me being a Mexican) I found very gratuitous and annoying. I’m giving this a 4.5. While I didn’t love every one of the 30 or so essays here, all were interesting, and the ones I loved, I loved a lot. I won’t bother listing my favorites because I think every reader will have their own if they like this sort of thing: thoughtful, insightful, and well-written pieces on economics, art, grassroots political movements, war, social justice, community, and the environment. Those that resonant deeply will depend upon one’s particular interests and passions, but I’m giving this a 4.5. While I didn’t love every one of the 30 or so essays here, all were interesting, and the ones I loved, I loved a lot. I won’t bother listing my favorites because I think every reader will have their own if they like this sort of thing: thoughtful, insightful, and well-written pieces on economics, art, grassroots political movements, war, social justice, community, and the environment. Those that resonant deeply will depend upon one’s particular interests and passions, but they’re all worth reading. I will read every essay she writes if I come across it on the internet. I did tire of them all together in a book, though. To her credit, the essays are well-chosen to reflect recurring themes. The title of this anthology arises from her belief that nonfiction is spacious territory that she roams: from realms of "investigative journalism to prose poems; manifestos to love letters, from dictionaries to packing lists." There are thirty essays here. "Essays explore; they also define; every essay is an entry in the author's personal encyclopedia." The topics range widely: the cultural history of California; the Occupy movement; how uprisings occur just when they do and how each cause contains multiples of causes; politics and policies and Silicon Valley, Iceland, the violence of climate change; what follows ruin after disaster; carnival and resistance in New Orleans. No matter what the topic, though, it is embedded in a sense of place. Instructing that a place is an intersection of many disparate elements that, she observes, pass through, whirl around, mix, dissolve, and explode in a fixed location. Her approach to writing about place (which she does, brilliantly, in this Encyclopedia) is to acknowledge and explore those elements that we often study separately. She lists such things that co-exist in place: ecology, democracy, culture, storytelling, urban design, individual life histories, and collective endeavors. In order to write wisely and with authenticity about place, it’s important to allow those elements to dissipate, dissolve, and blend; then, from the blending, comes the real story.Or maybe where the real story can begin. These dimensions add finely textured layers to her topics. They can disorient a reader; as well, they can explode a reader’s perspective. Place can become dizzying in its dimensionality. It’s uber mind-mapping--not the best comparison, but the closest I can get. Ms. Solnit releases her topics as if they are boomerangs and you can depend they will return to you, exploded, expanded, explained. In Solnit’s writing, the whole is exponentially greater than the sum of its parts. I read this as the civil disobedience protests in Baltimore were unfolding, which was a rather apt time. A large chunk of the essays in Solnit's "encyclopedia" examine the myth of looting. In the process she exposes the media and cultural fixation on property over people, arguing that in most cases (and it's important to note that her case studies are natural disasters, the Haitian earthquake and Hurricane Katrina in New Orleans) during catastrophes civil society emerges to fill in the vacuum le I read this as the civil disobedience protests in Baltimore were unfolding, which was a rather apt time. A large chunk of the essays in Solnit's "encyclopedia" examine the myth of looting. In the process she exposes the media and cultural fixation on property over people, arguing that in most cases (and it's important to note that her case studies are natural disasters, the Haitian earthquake and Hurricane Katrina in New Orleans) during catastrophes civil society emerges to fill in the vacuum left by the environmental disruption. Most people, she notes, are "looting" to feed or care for their families and communities. She goes on to say that while things like TV's do also get taken, it's a small price to pay, and that attempting to protect property requires redirecting resources away from more critical needs. In her examples, these needs largely amount to rescuing people affected by natural disasters, but one can easily apply it to something like Baltimore. The difference there might be that focusing on "looting" diverts public attention from the much more critical issue of systemic racism. The book is about more than "looting." Solnit is never short of reliably left-wing critiques running the gamut of environmental hazards to public shaming of rapacious capitalists. If there is a strong unifying element through the book it's an exploration of the power of civil society. She's working towards a rallying cry. Unfortunately, some of the more hopeful moments (Occupy Wall Street, the Arab Spring) maybe didn't go on to the be the utopian ideal Solnit is clearly hoping for. Often when I read systemic critiques it feels like there's nothing to do with my anger after the fact. Everything can start to feel hopeless, but Solnit does an admirable job of balancing the fatalism and rage with moments of hope. I give her kudos for that! I started this book and frankly ran out of gas before getting deeply into it. Now it is due and I must return it to the library. The opening essay, "Cyclopedia of an Arctic Expedition," is breathtaking. It is structured as a set of encyclopedia entries - alphabetical, of course, and complete with "see" and "see also" entries - which you'd think would be staid and dry. But the writing is gorgeous and I found myself reading both forward and backward to connect all the observations. I can envision u I started this book and frankly ran out of gas before getting deeply into it. Now it is due and I must return it to the library. The opening essay, "Cyclopedia of an Arctic Expedition," is breathtaking. It is structured as a set of encyclopedia entries - alphabetical, of course, and complete with "see" and "see also" entries - which you'd think would be staid and dry. But the writing is gorgeous and I found myself reading both forward and backward to connect all the observations. I can envision using this narrative structure as a journaling technique during future travel. I should've abandoned the book upon a minute's reflection on its pretentious title. I'm definitely kicking myself that I didn't abandon it after reading the incredibly pretentious introduction. She sounded so utterly full of herself that I was surprised she hadn't capitalized the word "writer." I plugged along, and thought the opening essay, about her trip to Antartica, was moderately interesting, even though I didn't fall in love with one sentence. Then, the second essay was a rather dated one ab I should've abandoned the book upon a minute's reflection on its pretentious title. I plugged along, and thought the opening essay, about her trip to Antartica, was moderately interesting, even though I didn't fall in love with one sentence. Then, the second essay was a rather dated one about the Arab Spring, and she seemed way out of her depth as well as continuing to sound off-puttingly stuck-up without the slightest shred of evidence for such airs. My interest in this collection specifically came about after reading Brain Pickings piece on Solnit's essay, 'We're Breaking Up.' http://bit.ly/1PRSLGf (Read the essay on Solnit's website here: http://bit.ly/2e4MGuu ). Of course, what is covered in this book goes far beyond this essay. Solnit's subjects are wide and her interests deep. A great thinker of our time. It's hard for me not to love everything Solnit writes. She has a fluid and perceptive way of interweaving literature, history, and psychology; one of my favorite essays in this collection connects the lonely homemaking of Martha Stewart with gender and home in The Odyssey and religious retreats both modern and past. Solnit is intelligent, well-researched, but she allows questions to connect and lead her work, rather than assumptions about meaning. It is a book full of essays. I liked some essays better than others. Which is okay. Overall, this is a great assortment of her work. I am looking forward to reading her other work as well. I first read Solnit's "Men Explain Things To Me" and my response was, "More. Please!" I love these essays. For one, some are centered on San Fransisco and I lived there many lifetimes ago when it was still an ideal place for a struggling single mother to raise a mixed-race child. And then there's the way Solnit, expressing herself sublimely, makes you feel really pissed off at the status quo while managing to suggest reasons for joy and hope. More. Please! Rebecca Solnit's books are a light in the darkness as she tirelessly demonstrates in essay after essay that small actions do work, that positive change is happening, and that everyday ways of living and being can be profound. Covering everything from the Arab Spring and Zapatista revolutions to the BP oil spill and climate change, these are important essays, when reminders that "the true revolutionary needs to be as patient as a snail" seem especially relevant. Rebecca Solnit is an amazing author, but these are heavy essays requiring time to parse, and process. Part travel diary, part anti-war narrative, part aggressive environmentalism, these essays speak to the tragedy that is the current state of the world, and to the hope that can be found in those fighting back. I love the way Solnit approaches topics. She eases into each essay with musicality, poetry, imagery, and personal narrative making every point more poignant. It’s nice to get a collection of her previously published works together in one place to see the wide variety of topics and styles she masters. The usual mix of heady optimism about current trends and gimlet-eyed analysis of just what the hell is wrong with the currently wrong with the world that one expects from Solnit. Enjoyable, even if the 'current events' in the collected essays are feeling oddly dated across the short span of the Obama-Trump divide. Hope, wrapped in unimaginable pain; promising holds on a near-featureless face; the promise that the people around us are better than we imagine them to be, and that we are inventive enough (and, maybe-just-maybe, powerful enough) to—together—find a way to higher ground in time. I’ll be chewing on the details of these stories for quite some time. Especially enjoyed the Iceland pieces, and the Arctic expedition. Learned a lot about mercury and gold mining in California-- which makes me wonder if mercury is equally not talked about in the Klondike gold rush. A strong collection of essays. Solnit is a major talent; however, her writing feels stronger when she is observing outside the US. Solnit's prose is incredible. All these essays are good reads. I would model my writing off of this. I don't share her political views, but I learned a lot and it's refreshing to hear well articulated social and political commentary. Nice evocation of Venice during the Jazz Age. Especially liked inserting Elsa Maxwell. What an incredibly compelling read. Solnit is Certainly one of the most talented authors of our time. Evocative, provocative and exceptionally articulate. Inspiring writing about what matters, great observations and examinations. Great nonfiction essays about travel, nature, and the effects of global politics (and global warming) on common people. Poetic at times, but consistently impactful.